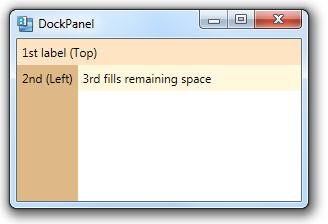 By default, the last child in the list of child elements of a DockPanel will automatically grow to fill the available space, regardless of the value of the DockPanel.Dock property. This happens because the DockPanel has a property called LastChildFill that defaults to true. If we set it to false, we can then dock the last child element–and it will not fill all of the available space.